You may have seen it in your local health food or specialty store. It’s that interesting tea-like beverage sprouting a mushroom-like topping with various bits of floating debris swirling throughout. Don’t be turned off by its appearance. Kombucha tea is a millenia-old drink that the Ancient Chinese referred to as the “immortal health elixir.” The popular drink was renowned for its ability to ward off cancers and various health conditions, and was also used as a cure for many of the top illnesses of the day. During the first half of the 20th century, Russians and Germans attributed the practically cancer-free areas of their countries to kombucha, as the areas where the beverage was regularly consumed most boasted the most vibrant health. Research into what made kombucha so special was explored in depth, but halted as the first World War brewed and scientists’ attentions were placed elsewhere. Kombucha was introduced to America during the 1990s, and has since become a popular drink among health-conscious individuals. Kombucha is nothing more than a fermented tea. It is a combination of bacteria, yeast, sugar and green or black tea. The bacteria and yeast form a SCOBY, or symbiotic colony of bacteria and yeast. 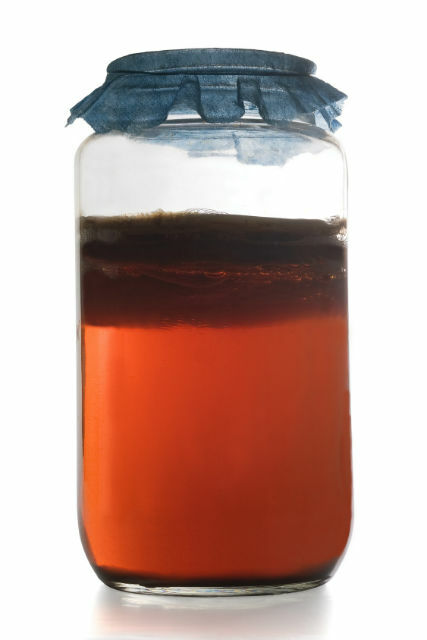 The tea is allowed to ferment for seven to ten days in a glass jar, resulting in a mushroom-like blob floating on the surface. The taste of raw kombucha is unique to say the least. It is often described as earthy, somewhat tart with a hint of vinegar overtones. Often juices or sweeteners are added to lessen the pungency. Though an acquired taste, kombucha is chock full of health benefits. The Ancient Chinese claimed it warded off illnesses of all sorts and multiple Asian cultures continue to drink it regularly today. 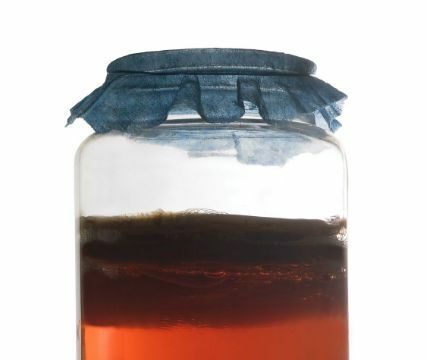 Americans are catching on to kombucha’s numerous health benefits, and more stores are lining their shelves with various brands of the fermented tea, and with good reason. Kombucha is an excellent source of many naturally occurring antioxidants and enzymes. An Indian study found that oral consumption of kombucha tea provided potent antioxidant and immune-boosting properties and helped protect DNA from damage. Because kombucha is fermented, it is excellent for improving the landscape of intestinal flora. Much of our health relies solely on these important microbes that make up our microbiome. Our immune system resides in our intestinal tract, and an imbalance or lack of these microbes can result in decreased immunity and increased instances of illness, inflammation and chronic conditions. The tea can also be considered an anti-cancer drink as it is very high in glucaric acid. Research has shown that this unique compound provides numerous anti-cancer benefits. Coupled with the detoxifying power of several key enzymes and beneficial bacteria, it is no wonder areas where kombucha is consumed regularly enjoy fewer instances of cancer. Kombucha is also an excellent source of several B vitamins. These important nutrients play key roles in the body’s numerous metabolic functions and aid in maintaining strong hair, skin and nails. When purchasing kombucha, avoid brands that contain high amounts of sugar or added sweeteners, as these counteract the benefits of the tea. Opt instead for added herbs or spices. These enhance the flavor and contribute antioxidant properties. Hey Buddy!, I found this information for you: "Kombucha Tea is the Health Elixir You Need to Try Now". Here is the website link: https://www.thealternativedaily.com/kombucha-tea-health-elixir-need-try-now/. Thank you.